CPALead is an awesome way to make money online. If you’re not familiar with CPAlead, basically they pay you for getting people to “do stuff” hence CPA which stands for cost-per-action. This could be anything from getting someone to sign up to something, complete a survey or install an application. The great thing about CPALead is that they offer both non-incentive & incentive offers. Generally with most advertising networks you cant offer visitors incentives for clicking your ads, and if you did you’d probably get banned pretty sharpish. However with CPALead the ads might say something like “Click here to get a free iPhone”, and if they complete the offer then you get paid. It’s great because not only do they offer high payouts (for me usually around $1 to $20), but they convert really well too since their offers give the visitor an incentive to actually complete the offer. 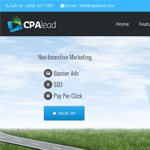 Not only do CPALead offer high payouts & great adverts but they also offer a wide range of ways you can monetize your traffic. Basically you can lock a page on your website & require that the visitor completes an offer in order to gain access. There’s a lot of money to be made with this widget but it’s important to make sure the content on your page is valuable enough to make sure that the visitor will stick around and complete the offer otherwise they’ll just leave your website. With this widget you can lock a file & require a user to complete an offer before they can download it. For example you might have an e-book & rather than selling it you could offer it for free but lock the page & require the user to complete an offer in order to download it. You don’t even need a website in order to use this widget, basically you can lock any link you want. So let’s say you’ve found something on the web, you can lock the link to the page using CPALead’s link locker and require people to fill in an offer before they’re redirected to the link you locked. You could post your locked link on social media etc & drive traffic through really easily. This ones similar to the download widget mentioned above however with this one you don’t need your own website. One of my favorites – with this one you can make money from the people that are leaving your website. When they go to leave they’ll be prompted with an offer which is a bit intrusive but since they were leaving anyway who cares right? Fantastic banner tool – you can choose non-incentive or incentive banners (I love incentive banners!). It can act as a normal banner whereby it’s basically an image on your page, or you can choose to have it slide in from one of the sides of the page – I find the slide in banners convert extremely well. One of the best things with CPALead is that they give you full control over your offers – you can pick and choose which ones you want to display. You could base this on a variety of factors such as best converting, highest paying or ones most relevant to your niche etc etc. So how do you make money with CPALead? Making money with CPALead is so easy because of 2 reasons really. Firstly, they give you incentive offers so getting a user to complete in your offer is straight forward. Secondly, they have a community where you can chat amongst each other and discuss which methods are working best. Plus they actually have their own marketplace where other members have written guides that you can buy. You can read reviews from other members & judging by the reviews you can tell which guides seem like they might work best & be helpful to you. etc etc.. I’m sure you get the idea. Once you’ve found something it’s simply a case of just driving traffic to your page which is really easy, and you can read one of my guides on getting traffic here. That guide refers to getting traffic to your blog, but it can also be used to get traffic to your CPALead website quite easily. If you already have a website I’d definitely recommend implementing the exit traffic tool or at least trying it to see how it converts with your visitors. Making money from people who are leaving your website is a great way to boost your websites revenue without being too intrusive to your regular visitors. Furthermore I’ve found their banner tool to work extremely well, especially the sliding one. For me it averages payouts of around $1 per submission but being an incentive offer it received an awful lot of submissions on my website. Worksheet Processor Jobs – Any Real Ones or Is It Just a Scam? 16 Responses to "How To Make Money With CPALead"
Hi Dale…your blog is A+..Please send me an email. Your post is very helpful to the beginner. after I created a content Locker, or how to make the link work between the content locker page and my webpage. Do i select the offer and past that link code into my website and the content locker at the same time ? With the content lockers, all you do is create the content locker inside CPALead and then add the code they provide to the HTML section of your webpage… then when somebody visits that webpage in their browser they are prompted to complete your offer before they can view the page. Hey Dale, cool article. My question is what is the action they are paying for? I see alot of weight loss offers with big pay outs (raspberry ketone type offers pay over $30), do these require people to buy something in order for you to get paid, or just fill out the long form? Its rather confusing because none of them mention what the actual conversion point is. Thanks in advance for your answer. Hi Jay, it’s been a while since I’ve done anything with CPALead as I’ve been focusing my efforts elsewhere lately. I couldn’t comment on what type of offers they run now, but previously I know that they did run all sorts of different offers such as pay per app install, pay per survey etc. $30 is certainly a high payout so I would say it’s most likely that they’re paying you for getting somebody to purchase something or sign up to a subscription service. There is a section in CPALead where you can review the offers, filter which ones you want to display to your users & demo them – you should be able to find out from there what the conversion point is. Hope that helps. Thanks! I am with cpalead since a while, but I’ve not tried all the tools they offer yet. hi dale can you tell me. Have people pay for that offers? Cause I see many offers like this they required cc details. Please can you send me email about this. Hi Dale, very nice post. I liked the redirect to your traffic sources. I also joined your Blog and Bank site. I would love to partner with you on some of the training modules that aren’t finished yet. I to have a training program but haven’t monetized it like you have. So instead of me monetizing my training I would promote yours as it looks much better than mine. I believe if you finish those modules you will have a more professional looking site. I can also help you with training questions like setting up campaigns in Aweber or other CPA platforms and how using a rotator can help with testing landing pages as well as sales copy. I am full of information and would love to start using it. Tell me what you think. Hey Rey, thanks for your comment. I’d love to hear more about your training, maybe get a sample too. I think it would bring a fresh approach to B&B having more than one person deliver the training, and also I’ve got some really big things planned for it too. Feel free to hit me up via the contact form on this website and send me a direct email with more info, I’ll be looking forward to hearing from you. Hello Tony, I just took a look inside CPALead’s back office and I can’t find it either. It’s possible that they’ve removed it as they now offer a whole bunch of a new implementation methods – I’d suggest reaching out to their support & asking the question there. Sorry I couldn’t be of more help. Thanks for this wonderful post on CPA, actually I just joined today and hoping I get as much results as possible. Nice Blog you have up here buddy!